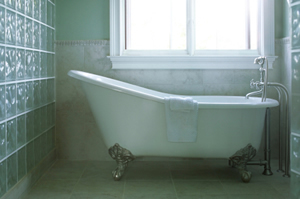 Your bathroom doesn’t have to be a cold, uninviting place. With in floor heating installed by the experts, you can turn your bathroom time into a luxurious and warm experience, even during freezing cold winter nights. In Floor Heating, or radiant floor heating, is an excellent way to bring warmth to any room in your home. You may be wondering why not just stick with regular heated air from a bathroom heater…well, with convective heating, the air is warm, not the surrounding objects in a room. With warm air, your skin is tricked into thinking that the environment is comfortable until your skin has to give up its heat to another object. And how many times have you sat on the toilet just to jump a little from the unforgiving coldness of that porcelain seat…? Well, with in floor heating, you don’t have to worry about cold toilet seats anymore! Likewise, the chilly bathroom tile flooring you installed with be surprisingly warm and inviting. Our In Floor Heating experts know exactly how to install radiant floor heating system with precision and ease, ensuring the work is done on time and on budget quickly without skimping on quality. Turn your cold bathroom – or any room, for that matter – into a warm and inviting space with in floor heating, radiant heating, or underfloor heating system installation from an expert plumber.